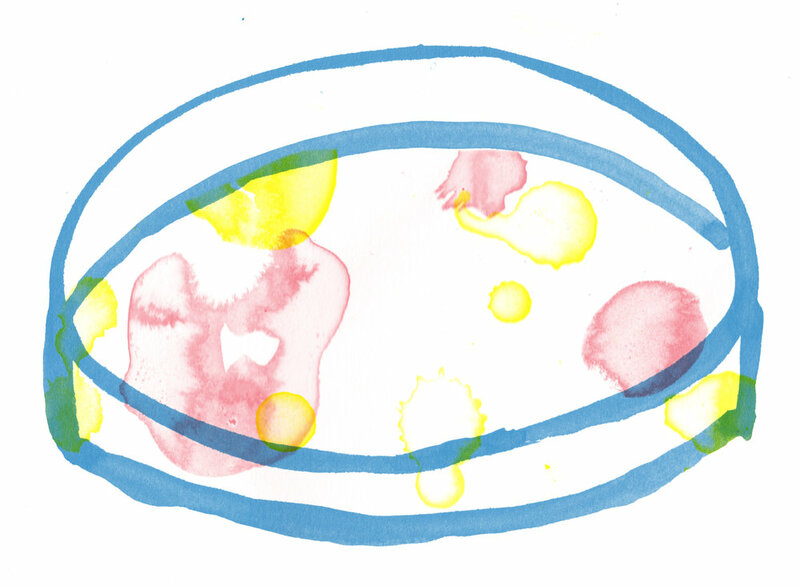 Nina Seale investigates the foodstuffs of the near future. Illustrations by Liam Rotheram and Bethany Thompson. She could be your great-great granddaughter, celebrating your 150th birthday. Party fare could be drastically different even in the next twenty years, let alone by the end of the century. It’s not even science fiction anymore – all of the above options are being developed around the world by innovators and survivalists who have the exciting job title of ‘Food Futurologists’. To begin our journey around the party table, we have to look at the issues facing food today, and the biggest one by far is the ever-increasing global population. There is a limited amount of crop space in the areas fit for the necessary high yields, and that is without even calculating the percentage of those crops which don’t go directly into our mouths – some of it we burn for biofuel, and even more is fed to livestock, a good proportion of that leaving through a cow’s rear end. To deal with these issues, food futurologists are creating meat alternatives to compensate for the fact that meat may soon become a ‘luxury item’, afforded only by the very rich. Obviously some of these alternatives are already on the market for vegetarians: Quorn, soy and tofu. Even if you aren’t vegetarian, it may be time to start coaching your palette, as these protein-rich meat substitutes may become your only option. However, for those die-hard meataholics, the food futurologists might have something for you. In 2013, the world’s first stem cell burger was unveiled, fried in butter and tasted by a select few at a press conference. It’s laboratory birth hiked up its value somewhat- it had cost £217,000 to produce. The general review was that it was lacking fat, so was a little dry, but also difficult to compare to a normal hamburger without ketchup and other seasoning. Four years later, companies are vying to be the first to mass-produce tasty stem cell burgers at a decent price, and their competition is to our advantage; we may be able to buy stem cell burgers from the supermarket by the end of next year. Another protein alternative is the kind of meat which creeps and crawls. Advocating the place for insects in your diet is world-renowned British entomologist and television presenter George McGavin. He may love insects for their zoological interest, but he also thinks they are severely underrated in the Western world for their culinary value. He goes on to explain that they are much more sustainable than current meat sources, not just because they digest a higher proportion of their food (so they produce much less waste than, say, cows), but also because they can be fed a much wider range of food. They also do not have to be bred in farms which take up more crop space. A tower of insect farms could be built, producing tonnes of insect meat a day, and there would be far less animal welfare issues than with intelligent, vertebrate livestock. Meat is not the only product our tables receive from animals. If we are going to be limited in our animal produce in the future, we’re going to have to think about where our milk and cheese is going to come from, too. But don’t fret, as a team of biohackers from California have come up with a biological solution to create ‘real’ vegan milk and cheese by manufacturing milk protein DNA and inserting it into yeast cells. The yeast produces the protein, which is then mixed with vegetable butter, sugar and water to make milk, which can be converted into cheese. Taking our futuristic food still further into the science fiction spectrum, we find 3D-printed food. 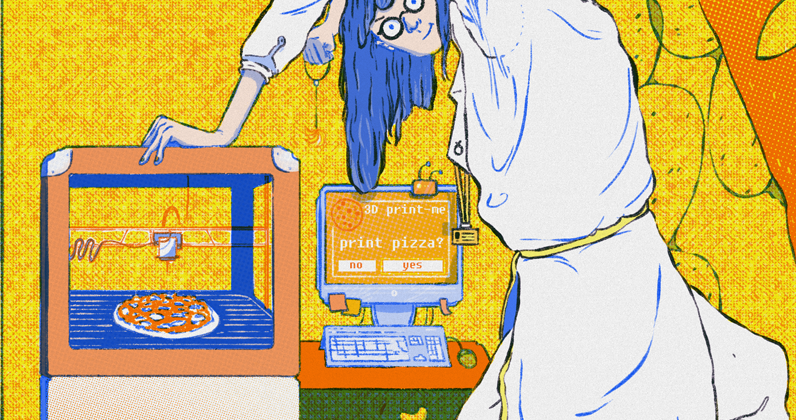 3D printers are now able to make pizzas, vegetables and even chicken fillets. Printing has already been offered as practical solutions to several food-related problems. In Germany, Biozoon are using 3D printers in retirement homes to manufacture soft food for people with dental problems. The creators of the food printer Foodini have suggested that their technology could calculate and deliver exact dosages of drugs, vitamins and supplements into printed food, tailoring to someone’s nutritional and medical requirements. However, there are limitations to 3D printers. Currently they are very expensive to buy and maintain, and they only produce food with customised pastes, which are also expensive and time-consuming to make. One food solution which shamelessly embraces chemical and additive cocktails are meal-replacement shakes. They have been in circulation for a while, specifically marketed for weight-loss and muscle building, and now they are moving into the mainstream. Huel claims that it’s ‘nutritionally complete powdered food’ has, “the perfect balance of carbs, fat and protein and all the vitamins and minerals your body needs,” so “you can replace all your food with Huel”. Perhaps adopting the Huel diet is the quickest, cheapest way to a very healthy meal, but it obviously takes all the exciting taste, texture and preparation out of mealtimes. Cooking and eating meals are sociable activities, bringing people and families together, one that our future society would miss. This brings you back to your 150th birthday party. We have gone around the table now, and only one dish remains undiscussed. “How do you connect with celebrities?” Bitelabs asks in a recent promotional video. Apparently social media is not enough – cannibalism is the thing. Bitelabs is trying to capitalise on celebrity culture by taking cell samples from well-known individuals and cultivating meat from them, similar to the stem cell burgers mentioned earlier. Are you tempted? Innovation is at the heart of food futurology, but perhaps this is a step too far.